During high season the beds are 10 + 2, while in the medium and low seasons can also limit the rent for 6 people. Old farmhouse dating to the late 1600’s has been completely and wisely restored. The villa is composed of two apartments on the ground floor surrounded by a hectare of cultivated fields, a park and swimming pool. The owner lives on the upper floor and is available to the guests for help with information and services. At guests' disposal: Swimming pool (14 X 6 mt, open from 1 of May to 30 September) for the guests - with roman steps. There is also a barbeque, a pizza oven and a large park. Baby bed available free of charge. Wi-Fi internet connection available. Cook available on request. Distances: Pratantico with all kind of shop at 300 mts. Located only 5 km from the centre of Arezzo, Cortona at 30 km, Florence 60 km, Siena 55 km San Gimignano 90km and Perugia 60 km. 140 m2 All on the ground floor: (apartment 1) large living room with a double sofa bed, kitchen with dishwasher and refrigerator, a double bedroom with bathroom with shower and a twin bedroom with bathroom with shower. (apartment 2) large living room with fireplace, kitchen corner with dishwasher and refrigerator, two double bedrooms with two bathrooms with shower. Annex with twin bedroom with bathroom with shower. The whole house has air conditioning (except for the bedroom in the annex. Excellent place to discover Tuscany!!! Clean, comfortable, spacious and welcoming after discovering the treasures of Tuscany and Umbria. The owners are onsite and very attentive to our needs and Giovanni spoke English fairly well. Location is fantastic and minutes to Arezzo but far enough away to feel like you have your own Tuscan villa that is within an hour or two of most everything in Tuscany and Umbria. 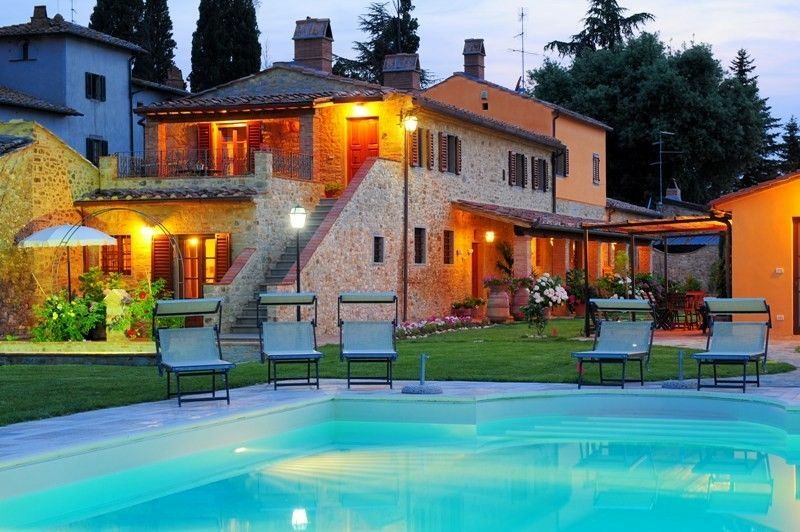 We would highly recommend this property for your Tuscan holiday! Me and my family we would express our sincere gratitude and thanks to Thomas, his wife and his daughter, which has been our American guests in Borgo Frosini in March 2014. We really enjoyed both their presence and their review. We really believe that this evaluation, so positive, can help us to continue in our care and attention to the guests. Our daughter studied at University of Oklahoma Arezzo and five of us traveled to meet her for Thanksgiving 2013. The property is a the lower level of a beautiful, immaculately-kept country home and has three bedrooms, three private baths and a large living area that includes a fully equipped kitchen and WIFI. The owner speaks English well and became a friend and great addition to our experience. His family has lived in the adjoining property for at least seven generations. The property itself is a beautifully restored 17th century farmhouse and has a beautiful pool which we did not use due to the timing of our visit. We chose not to rent a car, which was no problem. There is a bus stop about 100 yards from the property which delivers you to Arezzo and from there to anywhere by bus or train. Although Arezzo itself has many beautiful attractions, Florence, Sienna, Perugia, Assisi and most Tuscan destinations are a day-trip away by bus or train. Rome is a little more than two hours away by train. We recommend this property with enthusiasm and without any reservation. We loved it. Nous gardons un très bon souvenir de nos deux semaines dans cette villa près de Arezzo. La maison est très confortable, le lieu très calme et la piscine délicieuse. Il faut également souligner la gentillesse de cette famille qui nous a gâté par son accueil chaleureux et ses conseils pour découvrir la région. Nous recommandons vivement ce lieu magique. Encore merci beaucoup et peut être à bientôt. Splendido appartamento, completamente arredato e attrezzato, gli albergatori cordiali e ospitali. Zona tranquilla e (in macchina) solo a pochi minuti dal centro di Arezzo, negozi, e ristoranti. A 10 km dal casello autostradale (A1). Ringraziamo i nostri gentili ospiti olandesi per la cortese e puntuale recensione inviata, relativa al loro soggiorno nella nostra struttura. Many thanks to our dutch guests for the very kind review. It has been a real pleasure from our part to meet and have them as our guests. Best regards and “mille grazie”. I recommend this property. We spent there a beautiful end of summer holidays together with our baby and we really enjoyed it. The appartment was spacious, big, fully equipped kitchen allowed us to feel like at home. Close to beautiful Arezzo, this location is a great starting point for visiting different parts of Tuscany. Although second part of September is too late for using the outdoor swimming pool, we enjoyed the garden and we could just sit and relax around the swimming pool area. many thanks for this very kind review. It has been a real pleasure from our part to have those nice people as our guest.